How Many Plinky Prompts Have You Answered? Since Plinky first launched, almost one thousand prompts have been published. How many have you answered? What type of prompts do you skip? Tell us what you’d like to see more (and less) of, and we’ll make it happen. And remember that you can always suggest your own prompt to be featured on Plinky.com! The Plinky tag pages showcase the best and brightest Plinky-inspired posts that were recently published on WordPress.com. Want your answers to show up there? Simply connect your WordPress.com blog with Plinky, and be sure to add a Plinky tag to your posts! To increase your chances of being featured at the top of the page (and on Freshly Pressed), write a thoughtful, detailed answer with a descriptive headline, include at least one image, and proofread your post before you hit publish. Don’t have a WordPress.com blog? Create one for free! Want to Receive Plinky Prompts via Twitter and Facebook? What Makes a Great Plinky Prompt? Do you enjoy certain types of prompts more than others? Are certain prompt topics more appealing than others? If there’s anything you’d like to see more (or less) of, be sure to let us know. And don’t forget that you can suggest your own prompts here! Want to see your prompt featured on Plinky? Submit it here. 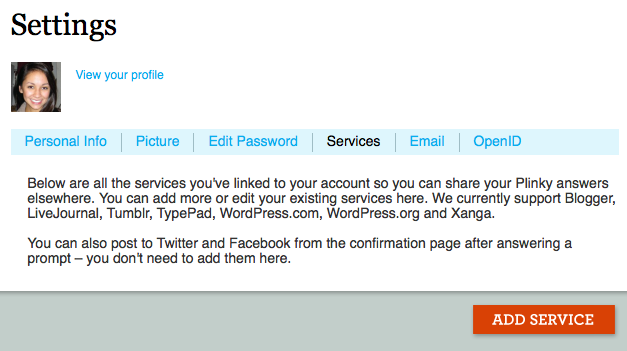 Did you know that you can connect your Plinky account to WordPress.com, WordPress.org, LiveJournal, Tumblr, TypePad, and Xanga? Connecting Plinky with another service will not automatically publish all your answers on your blog. You’ll be given the option to share each answer after it’s been posted, but it’s up to you to choose which ones to publish on other services. Simply log in to Plinky.com, locate Your Services on the right sidebar and click Add a Service! You’ll be taken to your settings page. Click Add Service. Next, select a service from the drop-down menu, then enter your login information. That’s it! Now every time you answer a prompt, you’ll have the option to publish your response on your blog with a single click of the share button.